They dub the change from a Hindu state to secular hasty-and needless. In revolutionary mode from the time King Gyanendra retreated to accept the supremacy of parliament, Nepal has been witnessing sweeping changes in its constitutional arrangement of governance—often to tremendous applause from the streets. But one among the new measures that surprised, even confused, the people was the parliament's decision to declare the world's only Hindu kingdom secular. In one stroke, the king of Nepal, recognised as an incarnation of Lord Vishnu, was reduced to an ordinary mortal without any divine power. And to think, only six months back the country's attorney general had in the Supreme Court claimed the king was above any man-made constitution because his responsibilities were of a divine nature. This declaration didn't elicit an euphoric response, as had other declarations depriving the king of his powers. Secular Nepal felt its first real pinch in Uttar Pradesh's Maharajgunj-Gorakhpur area bordering Nepal. Local BJP MP Mahanth Adityanath took out a procession protesting against Nepal's decision to become secular. A few days later, people in Birgunj town, bordering Bihar, came out to block streets and burn tyres. "It's a conspiracy against our national identity," protesters shouted. In some quarters there are fears that the new description of the Nepali state—secular as against Hindu—could provoke the Hindu Swayamsevak Sangh, the Nepali chapter of India's RSS, into employing its formidable network to mount opposition against the move of parliamentarians. The initial response, though, has been moderate. Its general secretary Mohan Bhagwat said, "The constitutional recognition of Nepal as a Hindu nation was symbolic of its ancient traditions and culture. This identity was so far safe under the Constitution. But now the people of Nepal will have to maintain eternal vigilance to safeguard it." Others tried to fathom the motive of parliamentarians to declare Nepal secular. For some, it was incontrovertible proof of the US, a Christian power, working behind the scenes to deprive Nepal of its Hindu-ness. Govinda Tondon, a respected scholar of Hinduism, told Outlook, "Church money has influenced Nepali politics in a big way. The recent decision to turn Nepal into a secular state can't be seen in isolation." Not a Hindutva votary himself, Tondon further adds, "The state should no doubt give equal respect to all religions. But Nepal as a state never practiced religion in extremity. Muslims were sent for Haj on state expense. Would that have been possible if Nepal had been an intolerant Hindu state in its behaviour?" The ruling Seven-Party alliance (SPA) discounts the theory of a foreign hand behind the declaration, or that it's directed against the Hindus who account for nearly 85 per cent of the population. The idea behind the move, say SPA leaders, was to render Nepal inclusive. It has 59 ethnic groups, and some of whom have animist and Buddhist backgrounds even though they were clubbed with Hindus in the census. As SPA leader Amik Serchan told Outlook, "Now every ethnic group, every individual, will have a sense of belonging to the nation." Contrary to popular belief, Nepal has been a Hindu state for a small part of its 238 years of existence. It was officially declared a Hindu state only 44 years ago, when King Mahendra, father of Gyanendra, dissolved the first-ever elected parliament and drafted a new constitution vesting absolute powers in the monarchy. He chose as his prime minister Dr Tulsi Giri, an RSS volunteer. The RSS links with the palace has persisted ever since, gradually turning political parties wary of the duo's agenda. Pro-democracy parties adopted secularism as their agenda in 2002, the year in which the Vishwa Hindu Mahasangh, an umbrella organisation of Hindu bodies worldwide, declared King Gyanendra the 'world Hindu emperor'. Again, VHP leader Ashok Singhal was the first foreigner King Gyanendra invited after he staged his 'coup' in February 2005. Singhal had then pledged to parade Hindus from across the world in support of the king. The RSS-palace nexus deepened as the pro-democracy movement gathered momentum this April. The king's cabinet released a sum of Rs 49 lakh to the Vishwa Hindu Mahasangh headed by his adc Gen Bharat Kesari Simha. To this mahasangh in Birgunj several pro-VHP sadhus were invited. 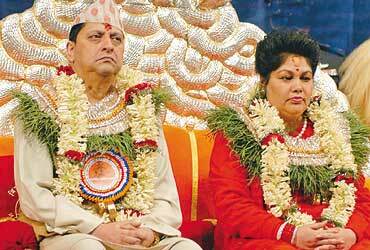 King Gyanendra graced the occasion, consequently portraying that the Hindutva brigade was opposed to democracy. Indeed, the king's ruthlessness in April—and its tacit endorsement by Hindutva forces—bolstered the resolve of many to declare Nepal secular, as had been envisaged in the draft constitution following the successful democratic movement of the '90s. Under RSS pressure, though, then king, Birendra, vetoed the draft proposal. Now, sensing that the king's power was to be whittled down, and that secularism was on the agenda of the Koirala government, RSS affiliates wrote letters to all members of parliament, advising them to desist from declaring Nepal secular. But they didn't take cognisance of the letter. Prominent SPA leader Modanath Prasrit says there never existed any justification for Nepal to exist as a Hindu state. "Why, Nepal could even have been a Buddhist state, given that Buddha was born here," Prasrit told Outlook. Yet, there are people outside the Hindutva brigade who feel the government's declaration was hasty. "The task of turning Nepal secular should have been best left to the proposed constituent assembly," points out Swami Ananda Arun, who heads the Osho Mission in Nepal. "I, however, feel a state like ours should be declared secular as certain sections of the humanity are being treated worse than Dalits." Others fear in the changing political climate, secularists (read Maoists) could sway to the extreme, and vent their contempt against religion. Says Dr Sanjeev Uprety, a philosophy professor in Tribhuvn University, "I support the concept of secularism, but its negative interpretation might instigate (secular) fanatics to attack temples and slaughter cows." Minority groups, however, are not worried about a secular backlash. As Dr K.B. Rokaya of the National Council of Churches in Nepal says, "There should be religious freedom in the country and its people should have right to adopt any religion of choice." Such statements have sparked fears that secular Nepal might decide to revoke the existing ban on religious conversion. This could politicise religion, provide the impulse for competitive religiosity. As Chintamani Yogi, principal of Hindu Bidhyapith, says "Under secular Nepal missionary activities could flare up and age-old harmony among various religious groups in the country could be endangered." This isn't to say that anti-secular Hindu groups ought not to be curbed. But instead of busting their network, the government has opted for a softer option of declaring Nepal secular. This change in nomenclature could only bolster the Hindutva forces.